We promised you powerful Features and we delivered! PlayerLineup.com offers your team an easy-to-use and feature-rich homepage. 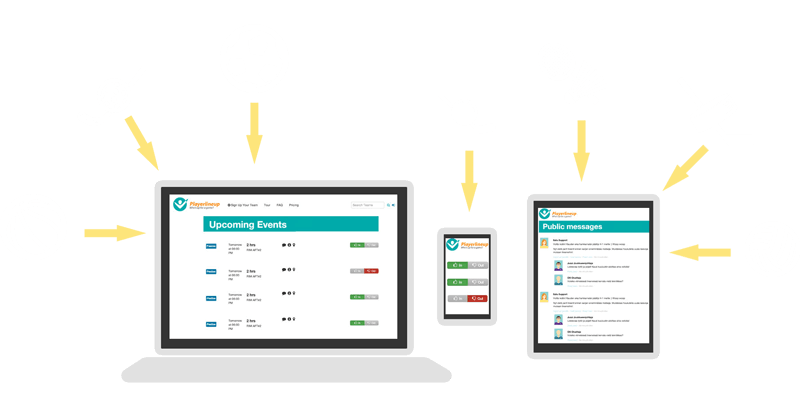 With a single glance you'll see the latest updates and attendance to your team's events. The Team Calendar is the heart of the system. It is created by the coach or manager, can be easily changed and edited, and is immediately accessible by all players on their very own club website. Of course, as coach or manager you’ll want to know as soon as possible who will be participating in what. No more wondering until the last minute who will show up. Whether by email or text (text messaging included with our Pro Package), you can request timely response from your players, and that allows you to view and print your participant list. Players can also view this list on their team website and are more likely to participate when they see that their friends will be there. This feature greatly encourages fast responses from your players. Our Calendar-to-Go is an added feature that keeps everyone on track more conveniently. Sometimes it’s just easier to print it out and hang it on the fridge. The Team Calendar can also be exported to most personal digital calendars/shared calendars, if desired. A Newsletter no one has to write! Once a week all your team’s current news, messages, event reminders, pictures and files are compiled into an automated Newsletter that is sent to all members of the team (unless they have opted out of receiving it). Newsletters are a great tool for keeping everyone happily engaged, thereby boosting participation. As club manager or team coach you will have access to each player’s name, photo, email address and phone number. This information is entered and updated by the players themselves on their profile page. No more chasing after information or sending messages to obsolete email addresses! Consider our PlayerLineup Pro Package! As mentioned above, you need it for communicating via text messages. The grid on our pricing page summarizes all free and all upgrade features. If you have a mature team, our Pro Package will serve you very well. But if you are just getting started with a sports team management system, our free version is more than adequate to save you time and energy. There is no cost and no risk. The worst that can happen is a recreational sports team that functions like a well-oiled machine. Are you the type of hands-on person, who wants to try before committing? We invite you to visit our Tour page where you can check it all out to your heart’s content and create your own sample site.